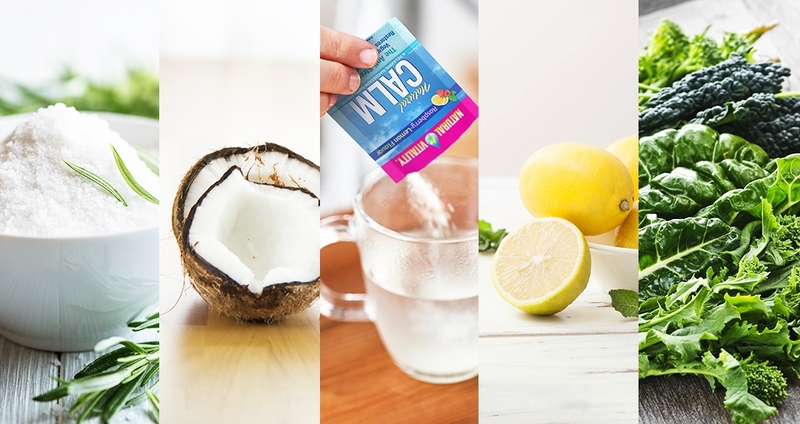 Do you know electrolytes are important (even if you don’t fully understand why) but feel hesitant to consume the artificial drinks famous for replenishing them? You’re onto something. It’s true: electrolytes matter. They regulate muscle and nerve function, hydration, blood pressure and your body’s pH levels. Deficiencies or imbalances in electrolytes—which include calcium, magnesium, potassium, sodium, hydrogen phosphate, bicarbonate and chloride—can cause everything from fatigue and muscle cramping to irregular heartbeat and seizures. When we sweat, we lose electrolytes; so it’s important to replace them. It’s also true that popular sports drinks like Gatorade and Powerade, which do contain electrolytes, are full of artificial ingredients and refined sugar. Fortunately, there are ways to get the electrolytes you need without resorting to these processed products. Sodium is one of the electrolytes that we’re quickest to lose through sweat. Luckily, ingesting salt is a quick and easy way to replace what we lose. Salt also contains the electrolytes magnesium, calcium and potassium; so it’s good for more than just sodium replenishment. Go for sea salt over table salt because it’s less processed. Himalayan and Celtic sea salts are widely available in most grocery stores. Just put a pinch in your water and drink. It’s that easy. Packed with nutrients and low in sugar, coconut water is a great way to rehydrate and replenish electrolytes, especially potassium. There are a lot of coconut waters on the market. Look for one with minimal ingredients, especially anything that looks artificial. Harmless Harvest uses only organic coconuts and is never cooked or boiled. Their minimal processing causes some of their coconut waters to turn pink when the antioxidants are exposed to light—it’s still totally safe to drink. If you have access to it, completely unprocessed coconut water, directly from the coconut, is always best! Magnesium is one of the most important electrolytes to keep replenished, since being magnesium deficient can cause insomnia, anxiety, muscle cramping, constipation and other problems. Natural Calm is a drinkable magnesium supplement that contains highly absorbable, water-soluble magnesium. Drinking a glass every night before bed is a great way to keep your magnesium levels on track. You can up the dose in hot weather or if you’re exercising a lot. Lemons are the queen of citrus when it comes to electrolytes. They’re a good source of potassium, calcium and magnesium. Add that to their ability to detoxify the liver, balance pH levels and boost the immune system with vitamin C, and lemons are officially a solid addition to any drink. Squeeze a whole lemon into warm or cold water for a sour jolt of electrolytes. No list is complete without a reminder to eat more green vegetables—and electrolyte replenishment is no exception! Leafy greens such as kale, swiss chard, beet greens, bok choy and spinach are packed with electrolytes. They are especially rich in magnesium, calcium and potassium. Celery, broccoli and avocado are good sources as well. You can add an electrolyte punch to any meal by tossing in something green.